Last year, my sister and I started a new tradition of baking goodies for our neighbors as a sweet Christmas gift. We made our signature pretzel rings last year, and this year I wanted to make a cookie recipe I've been eyeing for a while, Andes Mint Cookies. 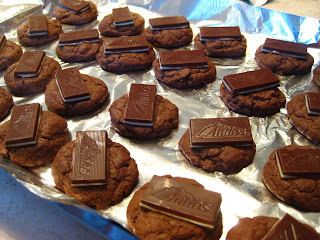 These were delicious and by far the easiest cookies I've ever made, besides break-n-bake or funfetti cookies! 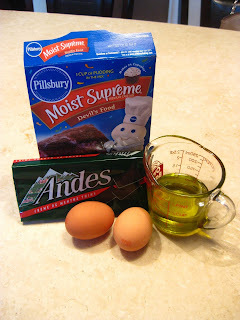 Here is how I made them in detail for those of you who don't have much experience baking. Preheat oven to 350°F. Mix together the cake mix, eggs, and oil. For cookies, I like to mix with my (washed) hands or a fork since the dough is thicker. 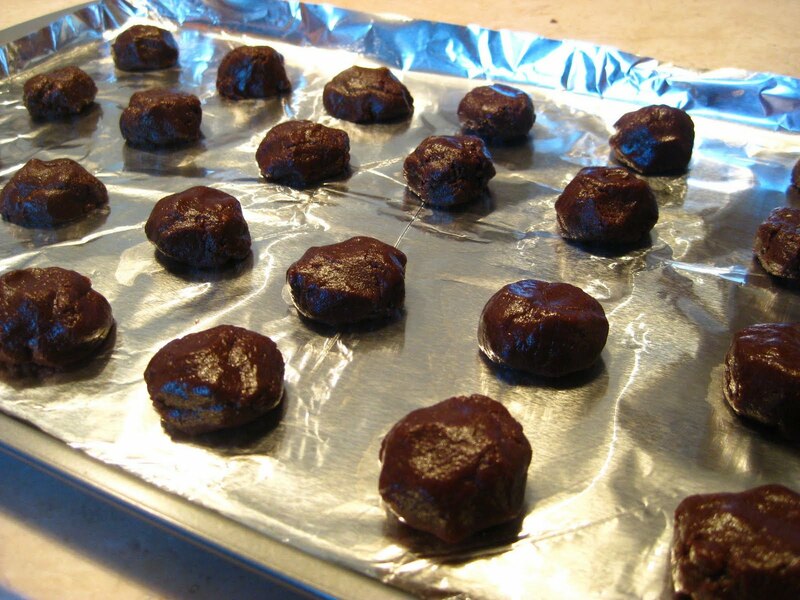 Once everything is well-incorporated, use a spoon to drop spoonfuls of dough on a non-stick cookie sheet (I always use foil to cover the cookie sheet so that I have one less thing to wash). You can make the cookies whatever size you want. I would suggest that their diameter is at least the length of an Andes Mint to make the last step easier. Bake them for 6-8 minutes. I usually set the timer at the lower end of any baking time range just in case. If they're not ready, keep a close eye on them for the next few minutes until they're ready. You want them to still be soft when you take them out since they'll still be cooking after you remove them from the oven. 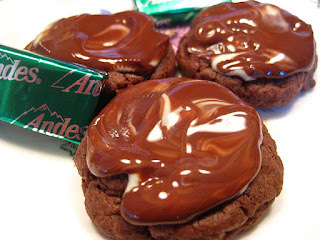 While they're baking, remove the wrappers from the Andes mints to make the next step easier and faster. 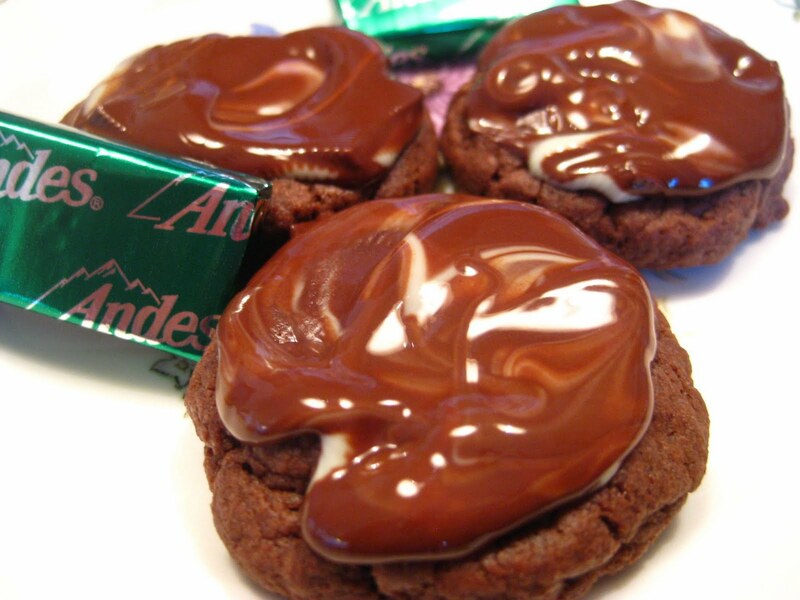 Immediately after you remove the cookies from the oven, place one Andes mint on top of each cookie. Let them sit for about 5 minutes and then spread the melted mint like frosting, but not too much since you want to get the swirly look of brown and mint green. Next part is my favorite...eating them! You can eat them right away while they're still gooey or wait til the chocolate hardens. I would suggest pairing them with a glass of milk since they are extremely rich and decadent. Mmm...SO good. Hope my neighbors enjoyed them and I hope you try this out and enjoy them yourself! That looks amazingly delicious! I'll be following your blog from now on :) Happy New Year!